Update: The Tate’s Bake Shop recipe has become one of my favorite recipes for thin chocolate chip cookies. However, getting consistently thin and crisp cookies requires precision, so I’ve noted the gram amounts that give the best results. Normally when we have these street parties people bring potluck dishes, but tonight it’s catered and all I’m taking is wine. So today’s recipe was something I made for myself and “myself” wanted (as usual) a copycat version of Tate’s Bake Shop chocolate chip cookies. I’d been meaning to try these for a few weeks and am glad I finally did because they look a lot like the original and taste great. I still want to try them with European style butter, though. And while these are crispy, they don’t have quite the same crispness as the original. Maybe the European style butter will solve that problem too. I’ll get back to you on that. These cookies are supposed to be thin and crispy. I've made them for several years and have learned a thing or two, so take a look at the notes if you get a chance. Preheat oven to 350 degrees F (176 C). Line some cookie sheets with parchment. Mix together the flour, soda and salt; set aside. Cream the butter and both sugars with an electric mixer. When creamy, beat in the water, vanilla and eggs. Beat eggs just until mixed – don’t over-beat. Add the flour mixture gradually and stir until almost combined, then add the chocolate chips and stir until all flour is incorporated. Scoop up tablespoons of dough (only slightly rounded rather than heaped) and arrange 2 inches apart on cookie sheets. Bake or 12-14 minutes or until cookies have brown edges and look done. Let rest on cookie sheets for about 2 minutes, then transfer to a wire rack to cool. The original version says to bake at 350 F, but I've found I get a more evenly baked cookies when I bake at 325F for slightly longer. I also get nicely shaped cookies when I scoop all the dough ahead of time into balls, press the balls into little discs, chill the discs for several hours, then bake. When baking chilled, preformed dough, the cookies sometimes take up to 20 minutes. Check at 12 and then keep an eye on them. 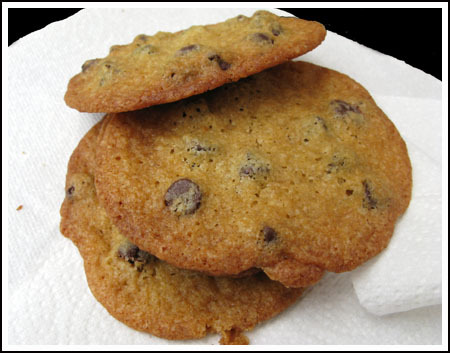 Except for butter, this is the chocolate chip recipe I have used since I was a girl! I got the recipe in either 4-H or brownies, I can’t remember….too long ago! I make them (doubled of course), my mom and sister also make them. Our recipe calls for, this is doubled, 1 cup of shortening. Although my water is a tablespoon. I don’t have a clue what the water is in the original…I doubled it long ago! Sunday I made them with half cup shortening and half cup butter, unsalted of course. Personally I didn’t see or taste a difference. They’re just delicious anyway they’re made…ha I do think with the shortening, that it’s not a crispy cookie, it’s a lot softer, I wouldn’t call it chewy either. With half shortening and half butter, it still wasn’t a crispy cookie. Which is fine with me! I’ve been eating my chocolate chip cookies a certain way for years and I kinda like them that way! I just noticed how old these posts are, but decided to add my own anyhow. I just made the Tate’s Bake Shop cookies, and they came out beautifully crisp…just perfect. I used cheapo butter, because that is what I had, and baked them on a regular cookie sheet with a Silpat. I just finished making these and they’re GREAT! Mine are very thin. Even thinner than yours look in the photo. I baked them on uninsulated cookie sheets hoping that would help and I think it did. I was looking for this recipe to make Ina Garten’s Icebox Dessert, but now I can’t imagine doing that to these cookies! I think my guests will be more pleased with the cookies than they would be if I drowned them in whipping cream, Kahlua etc. Uh oh! Another CCC!! 🙂 It’s a good thing I’m going to be out of town for the week, or I’d probably have to make these. They look so good! Woo! Those cookies look very excellent. I really need to make these again sometime soon. Do you think that just adding a minute or two to the baking time would make it crispier, hopefully just short of burning? I saw a review for the cookbook in which the person mentioned adding some baking time to the recipe and got closer to the right crispiness, but I wonder if there’s a butter or sugar component that is different/lacking as well. Yay for homecomings! Hope your friend had a safe and healthy journey back.